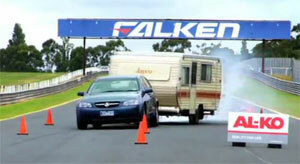 AN award-winning Victorian company has developed a unit which could drastically reduce the number of potentially lethal accidents involving caravans jackknifing. And the electronic sway detector has been applauded by a government minister who recently opened AL-KO's $4.3m Recreational Vehicle Technology Centre at Dandenong, where the sophisticated unit will be manufactured. "We have a great culture of caravanning in Victoria and this technology is not only an example of innovative manufacturing, but also something that will be welcomed as a safety measure by the thousands of grey nomad caravanners across Australia," Manufacturing, Exports and Trade Minister Richard Dalla-Riva said. Sensors inside AL-KO's Electronic Stability Control (ESC) unit monitor any build-up of caravan swaying and applies the brakes to control the vehicle and smoothly bring it back into line. Production of the ESC unit will create 18 new jobs at the newly opened centre. Mr Dalla-Riva said: "This centre strengthens Victoria as Australia's hub for recreational vehicle manufacturing, as home to more than 90 companies responsible for over 80 percent of manufacturing in this sector. "It is an automotive sector worth around $3 billion in annual revenue and directly employs around 6000 people across 1100 enterprises."